I was feeling pretty good the other day after writing my post about the December 1 festivities when someone pointed out to me that maybe I had my history wrong. I portrayed the 1918 declaration as a heroically brave but mostly symbolic gesture by just a few people but the history books say that over 100 thousand people were gathered in Alba Iulia that day. Is that even possible? Were one hundred thousand people (or even more) gathered in Alba Iulia on 1918? Or were perhaps those numbers partially inflated by Communist revisionist historians wanting to pander to Romanian patriotic sentiments? The official story is that, on the heels of the defeat of the Axis Powers (which included Austro-Hungary, the power that controlled Transylvania and what-is-now western Romania at the time), there were widespread nationalist independence movements throughout much of eastern Europe. Serbs, Croats, Slovenes, even Austrians, were all in the process of self-declaring themselves as new countries in the years 1916-1920 so it is definitely true that Romanians were riding part of that “wave”. 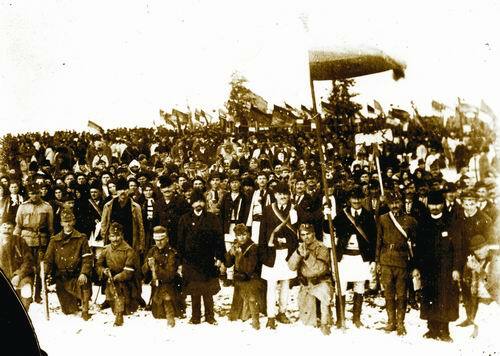 It is also true that Romanian delegates from all over majority-Romanian lands, including the official Kingdom of Romania (Wallachia and western Moldova), Bukovina (part of which is now Ukraine), Transylvania and other regions decided to hold a congress in Alba Iulia in the winter of 1918. This congress was by invitation only, which is extremely significant (as we will see below) and a grand total of 1,228 delegates met on November 28, 1918 in Alba Iulia. On the third day of that meeting (December 1), the great proclamation was read, announcing the unification of Transylvania and other western lands (then belonging to Hungary) with the rest of the Kingdom of Romania. A few weeks later, the (German) king of Romania declared the declaration official and, at least on paper, modern Romania was born. In reality, it took until 1920 for western powers (primarily the United States) to decide the new borders and thus make the 1918 Alba Iulia declaration more than just passionate words. So we know there were 1,226 delegates in attendance and we know that the congress voted on a number of issues, including who would be the two official priests (one for the Orthodox and one for the Greek-Catholic faith) and other matters such as land reform and giving women the right to vote (suffrage). And we definitely know that the climax of the big powwow was to declare the various Romanian lands united for the first time in history. But were there truly 100,000 people in attendance? Or even more, as some history books suggest? The first problem is that, for all the hard work that went into arranging the logistics of having 1,226 delegates meet in what was a freshly “liberated” (depending on your point of view) city in Transylvania, the organizers failed to have a single photographer on hand. One (ethnic) German photographer by the name of Bach had been hired but, for some reason, failed to show up. An ethnic Romanian from Transylvania named Samoila Marza, who had fought for Hungary during the war, heard about the Alba Iulia congress and decided to bring his camera equipment. Because he was not an official delegate, and had no invitation, he was not allowed inside any of the meetings. He was forced to stand in the crowd and take his photographs there. Because the weather was cold and rainy, and the photographic equipment in those days required long exposure times, he only managed to successfully record five photographs. These are the only extant pictures of what happened in 1918. Two of the photographs are of the congress leaders speaking to the crowds from an elevated stage. The other three photographs are of the people in attendance, and you can definitely see that a large crowd was gathered. But there’s just no way to extrapolate from these photographs, which depict maybe a few hundred people at most, to know if it is actually true that a hundred thousand people were there. The delegates must’ve been kicking themselves later for not allowing Marza into the proceedings because his photo “album” (with the only five pictures in existence of the declaration) was later packaged and sent to the post-war treaty negotiations, greatly strengthening Romania’s bargaining position as they showed that the people of Romania were serious about their right to self-determination. All three shots of the crowds show a large number of soldiers in uniform, which makes sense as the Romanian army (under protection from various post-war armistices) was in the midst of pushing deep into Transylvania. Three days before the congress in Alba Iulia, Romanian troops had seized the key city of Targu Mures (about 120 km east of Alba Iulia) and six days after the congress, Romanian troops took Turda (70km from Alba Iulia). Therefore it makes sense that a large group of active-duty Romanian soldiers were in or around Alba Iulia on those fateful days. How many Romanian troops were there in 1918? Well, that’s hard to say too. We know from solid historical sources that over 200,000 Romanian troops were killed during WW1, so clearly the army was quite large (its ranks ballooned by forced conscription). From what I’ve seen, about 400,000 Romanian men were under arms at the end of the war, so it’s quite feasible that several thousand, if not tens of thousands, were in Alba Iulia on December 1, 1918. The army was definitely still quite active, fighting a number of battles in 1919 with Hungarian troops, so there was no demobilization in 1918 (such as Germany and Russia were doing). So we know there were 1,226 official delegates and we know that several thousand, if not tens of thousands, of Romanian troops were close by, potentially in attendance. But what about the rest of the civilian population? The 1912 census (of only the Kingdom of Romania, meaning Wallachia and western Moldova) stated that there were about 7 million Romanians. The next census was held in 1930, and it included all of the new territories (Transylvania, eastern Moldova, etc) and it recorded about 13 million (ethnic) Romanians. Let’s split the difference and say that there were about 9 million total (ethnic) Romanians who technically could’ve heard about the big Alba Iulia party in 1918 and elected to attend. Could 100,000 of them then shown up? I sincerely doubt it. The population of Alba Iulia today is only about 60 thousand people and it was a lot smaller in 1918. My Hungarian language skills are non-existent so I can’t find any hard numbers for any census data on Alba Iulia in 1918 but let’s just imagine the city was half the size it is now, meaning that if every man, woman and child in town showed up for the 1918 congress then that’s still only about 30,000 people. All the rest of those in attendance, from the delegates to the ordinary people, would’ve had to find food and lodging, something a tiny town at the tail end of the war would’ve been hard pressed to provide. I am certain the delegates were taken care of, as well as any soldiers on duty, but what about the rest of the crowd? Where in the world could they have been living, eating and drinking for three days during a bitterly cold rain in that tiny city? Not to mention the fact that in 1916 (as I wrote about in my awesome article Die Stadt Bukarest ist von meinen Truppen besetzt), the country of Romania had been overrun by German troops, the royal family and government forced to flee to Iasi, and most of the countryside had been plundered and stripped bare by hostile forces. It’s true that in 1918 the momentum was swinging the other way, but freezing rain in a devastated post-war country was hardly conducive to long distance travel. Airplanes and cars had been invented but were not in widespread use, meaning every visitor to Alba Iulia had to arrive either via horseback (or horse-drawn carriage) or else by train, an expensive luxury for a nation of agricultural workers. Without better photographic evidence, it’s impossible to know just how many ordinary citizens braved the long trip by horse through the snow and the mud to attend that congress in Alba Iulia. Newspapers at the time focused on the text of the declaration and the advances of the Romanian army into (what was then) Hungarian territory without being overly concerned about counting just how many ordinary people showed up to witness the event. The king of Romania, Carol (the first), who lived in unbelievable luxury in his palace in Sinaia, was also not overly fond of keeping statistics on the peasants he ruled. In 1907, the agricultural people rose up in rebellion against his harsh rule and King Carol sent in the military to commit what was, in effect, mass genocide against his own subjects. We’ll never know how many people his troops killed because the king ordered all the relevant documentation destroyed. And so it wasn’t until the height of the Communist era, when Ceausescu led an effort to double and treble Romanians’ patriotic fervor, that the “official” history of the 1918 Alba Iulia declaration was fleshed out and the magical number of 100,000 created as an incontestable “fact”. I will say this much – Bucharest today is a city of over 2 million inhabitants and I’ve never once heard of 100,000 people gathering for anything, not the 1989 Revolution, not the 1990 “Mineriada” and not for any other reason. For a resident of Bucharest to join a protest in the streets, all they’d have to do is walk out of their own front door, and still you never see those kinds of numbers. So we are expected to believe that in a country with a grand total of (approximately) 9 million that 100,000 were so motivated to witness the Alba Iulia congress that they traveled vast distances to attend but the citizens of Bucharest, who only have to walk out of the front doors of their homes, have never once been bothered to do so? I call foul. Even the most optimistic assessments of the 1989 protests in Timisoara (which began the revolution, and lasted much longer than in the rest of the country) were 100,000 people participating, and this in a country that was much larger, with many more people than Romania in 1918. I simply cannot imagine that such a large crowd traveled hundreds of kilometers under primitive conditions to camp out in a tiny city without adequate lodging or food. I do, on the other hand, believe that 1,226 delegates and their various family members and associates were there in Alba Iulia in 1918. Let’s round that number up to 3,000. I also believe a few thousand local people from Alba Iulia and nearby parts of Transylvania showed up. So let’s just invent a number and say that’s 12,000 people, meaning that maybe about 15,000 civilians were on hand at the Great Moment if we’re being unbelievably generous. All the rest of the witnesses were on-duty soldiers, who may have been as many as 85,000 (giving us that magic total of 100 thousand) but it’s not like they volunteered to be there. Yes, they may have had the patriotic fervor burning in their soldierly hearts, but saying 100 thousand people were on hand is a lot different than saying a few thousand civilians were on hand plus five divisions from the Army who were conveniently in the neighborhood at the time. Does the true number of people who were in Alba Iulia on December 1, 1918 really matter? Not really. What is incontrovertibly true is that the ethnic Romanians of several lands did want to have their own country. It is also incontrovertibly true that this was a widespread, popular sentiment and that nearly all (ethnic) Romanians rejoiced when the post-war negotiations were resolved in their favor, officially awarding the Kingdom of Romania with huge swathes of new territory. It is also incontrovertibly true that the delegates, backed by the king’s authority and the king’s troops, helped pave the way to the Treaty of Trianon becoming reality by that 1918 declaration. I just can’t quite stomach the so-called patriotic “fact” that Romania’s most popular (in terms of numbers of people in attendance) historical event in its entire history from the beginning of time was to sit in the cold mud in a tiny town in 1918 in order to witness lengthy speeches from priests and a few politicians at a time when the majority of the population was illiterate and too poor to be able to afford a lengthy journey across a devastated post-war landscape. Saying that the 1918 declaration was Romania’s most popular historical event evaaar is just too convenient, too perfect for patriotic mythology, too glorious and smelling of unicorn perfume, for it to actually be true. Nonetheless, I do salute the people who were in attendance (however many there were), and I especially doff my hat (Ro: palaria jos) to the brave ordinary citizens who had no invitation and were uncounted and unsung but yet cared enough to make the journey and lend their support. Without them, nothing that followed would’ve happened, and I personally would’ve never had the chance to live in the beautiful nation of (modern day) Romania. Previous Post La Multi Ani!